It would seem that my two recent posts are getting noticed. On one of them, someone asked for the EGT R code I used. After I get the CSV file of the SD card, I first clean it up. Currently, I just do it manually using Vim, but in the future I will probably script it. It turns out that Garmin decided to put a header of sorts at the beginning of each CSV. The header includes version and part numbers. I delete it. The next line appears to have units for each of the columns. I delete it as well. The remainder of the file is an almost normal CSV. I say almost normal, because there’s an inordinate number of spaces around the values and commas. I use the power of Vim to remove all the spaces in the whole file by using :%s/ //g. Then I save and quit. 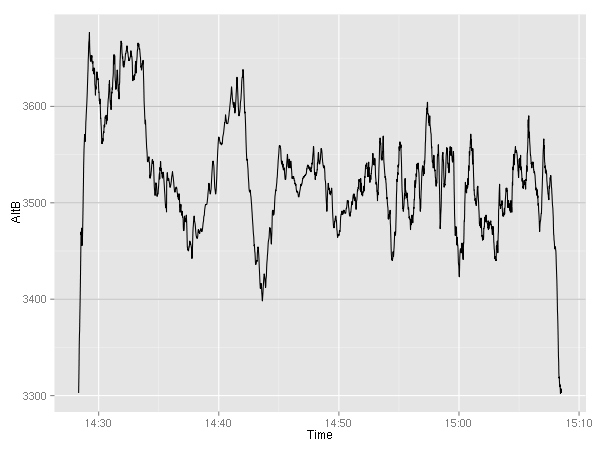 Now that I have a pretty standard looking CSV, I let R do its thing. "LclDate"   "LclTime"   "UTCOfst"   "AtvWpt"    "Latitude"  "Longitude"
 "AltB"      "BaroA"     "AltMSL"    "OAT"       "IAS"       "GndSpd"
 "VSpd"      "Pitch"     "Roll"      "LatAc"     "NormAc"    "HDG"
 "TRK"       "volt1"     "volt2"     "amp1"      "amp2"      "FQtyL"
 "FQtyR"     "E1FFlow"   "E1OilT"    "E1OilP"    "E1RPM"     "E1CHT1"
 "E1CHT2"    "E1CHT3"    "E1CHT4"    "E1EGT1"    "E1EGT2"    "E1EGT3"
 "E1EGT4"    "AltGPS"    "TAS"       "HSIS"      "CRS"       "NAV1"
 "NAV2"      "COM1"      "COM2"      "HCDI"      "VCDI"      "WndSpd"
 "WndDr"     "WptDst"    "WptBrg"    "MagVar"    "AfcsOn"    "RollM"
 "PitchM"    "RollC"     "PichC"     "VSpdG"     "GPSfix"    "HAL"
As you can see, there are lots of columns. 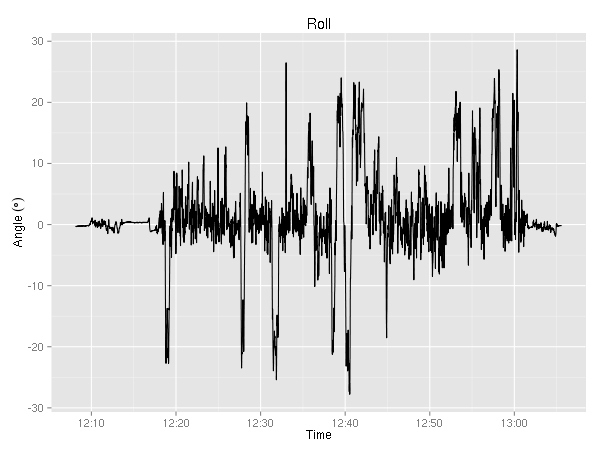 Before doing any plotting, I like to convert the LclDate, LclTime, and UTCOfst columns into a single Time column. I also get rid of the three individual columns. Now, let’s focus on the EGT values — E1EGT1 through E1EGT4. E1 refers to the first engine (the 172 has only one), I suspect that a G1000 on a twin would have E1 and E2 values. I use the ggplot2 R package to do my graphing. I could pick colors for each of the four EGT lines, but I’m way too lazy and the color selection would not look anywhere near as nice as it should. (Note, if you have only two values to plot, R will use a red-ish and a blue-ish/green-ish color for the lines. Not exactly the smartest selection if your audience may include someone color-blind.) So, instead I let R do the hard work for me. First, I make a new data.frame that contains the time and the EGT values. Then I use the reshape2 package to reorganize the data. 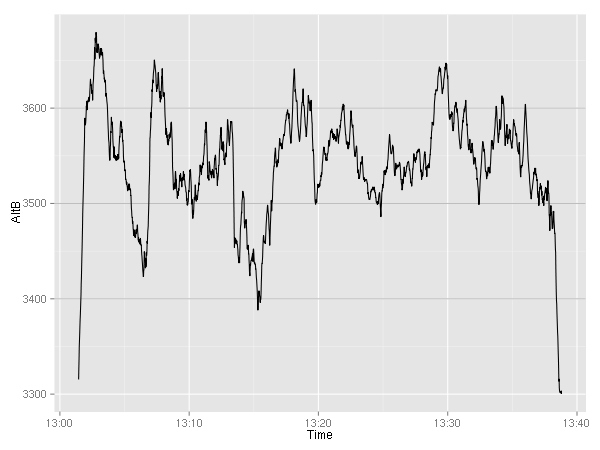 At this point, the data is ready to be plotted. That’s all there is to it! There may be a better way to do it, but this works for me. 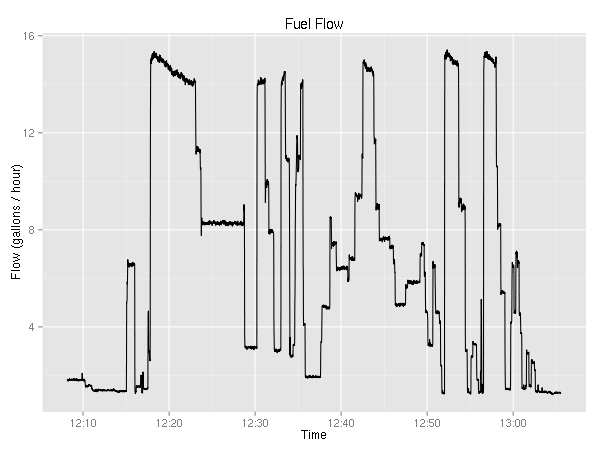 I use the same approach to plot the different altitude numbers, the speeds (TAS, IAS, GS), CHT, and fuel quantity. You can download an R script with the above code here. 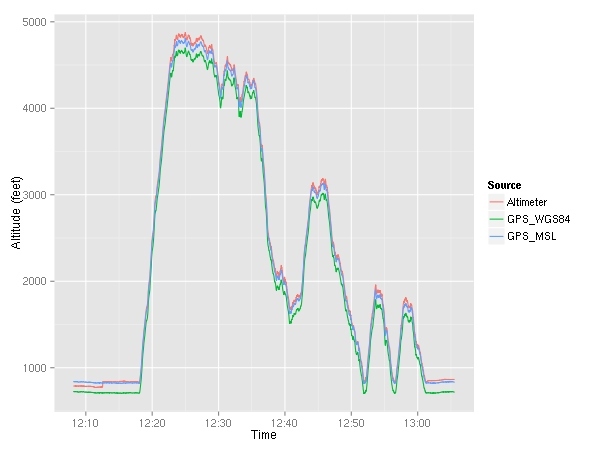 About a week ago, I talked about G1000 data logging. 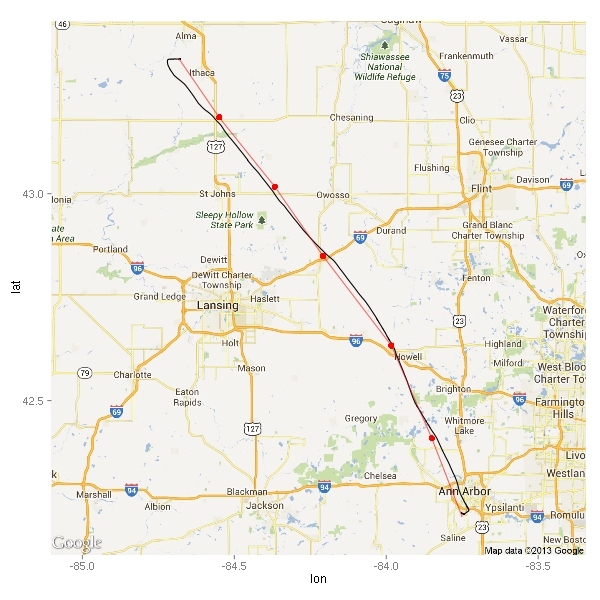 In that post, I mentioned that cross-country flying would be interesting to visualize. Well, on Friday I got to do a mock pre-solo cross country phase check. I had the G1000 logging the trip. First of all, the plan was to fly from KARB to KFPK. It’s a 51nm trip. I had four checkpoints. For the purposes of plotting the flight, I had to convert the pencil marks on my sectional chart to latitude and longitude. First of all, let’s take a look at the ground track. 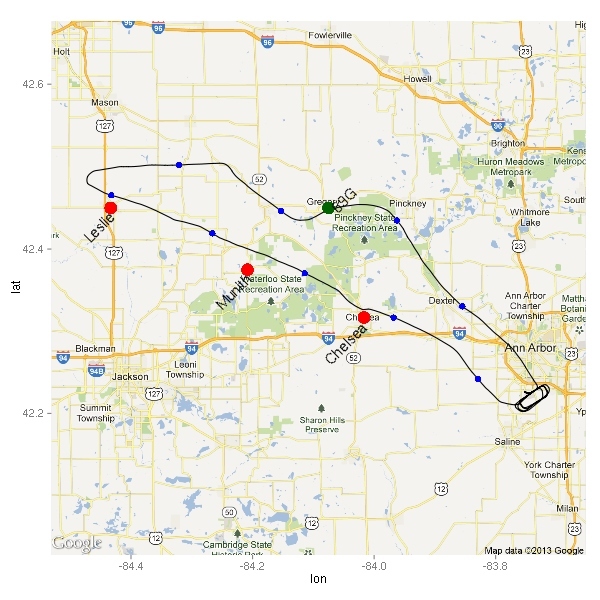 In addition to just the ground track, I plotted here the first three checkpoints in red, the location of the plane every 5 minutes in blue (excluding all the data points near the airport), and some other places of interest in green. When I got the plane, the NAV1 radio was tuned to 114.3 (SVM) with the 36 degree radial set. 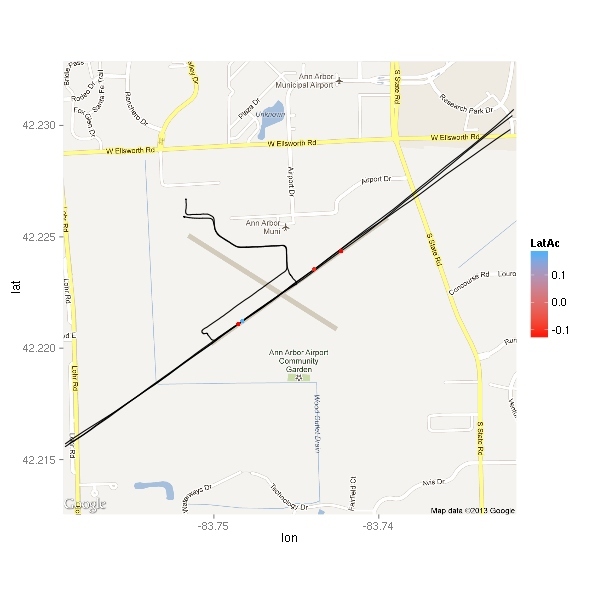 At 9:43:25, I switched the input for the HSI from GPS to NAV1; at 9:43:42, I tuned into 109.6 (JXN). 44 seconds later, I had the 50 degree radial set. Over two minutes later, I changed my mind and set the 60 degree radial, which stayed there for the remainder of the flight. 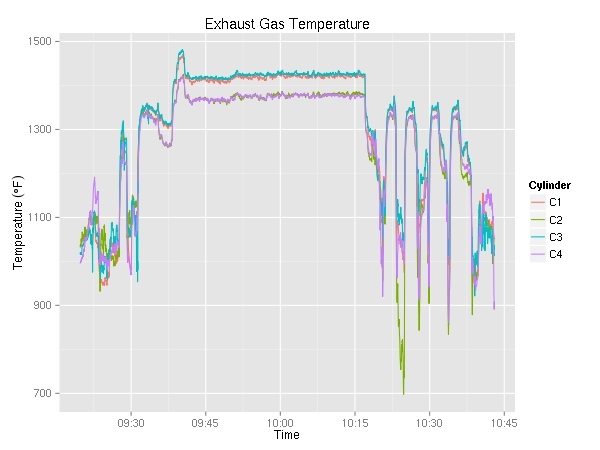 In my previous post about the G1000 data logging abilities, I mentioned that the engine related variables would be more interesting on a cross-country. Let’s take a look. As you can see, when reaching 3000 feet (cf. 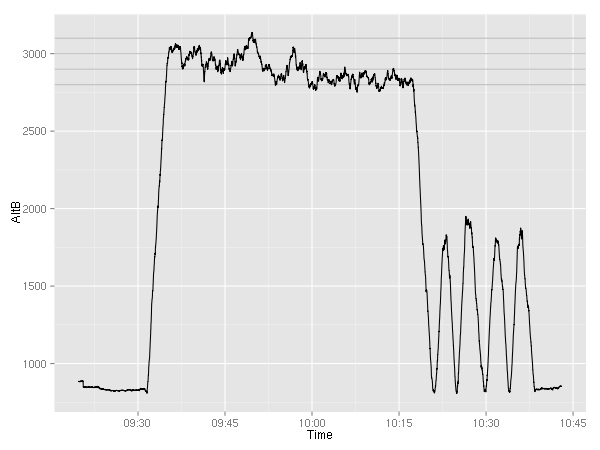 the altitude graph) I pulled the power back to a cruise setting. Then I started leaning the mixture. Interestingly, just pulling the power back causes a large saving of fuel. Leaning helped save about one gallon/hour. While that’s not bad (~11%), it is not as significant as I thought it would be. 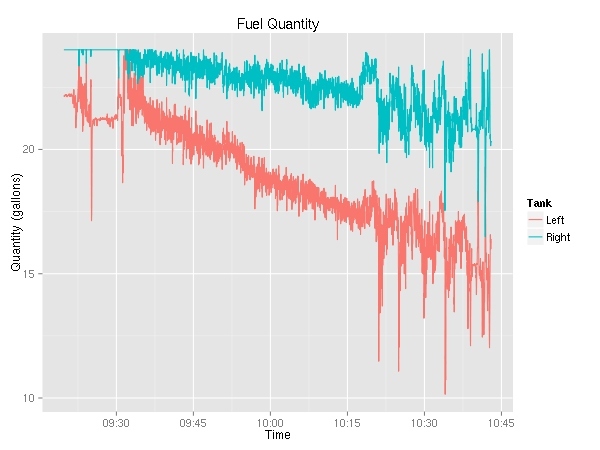 Since there was nowhere near as much maneuvering as previously, the fuel quantity graphs look way more useful. Again, we can see that the left tank is being used more. 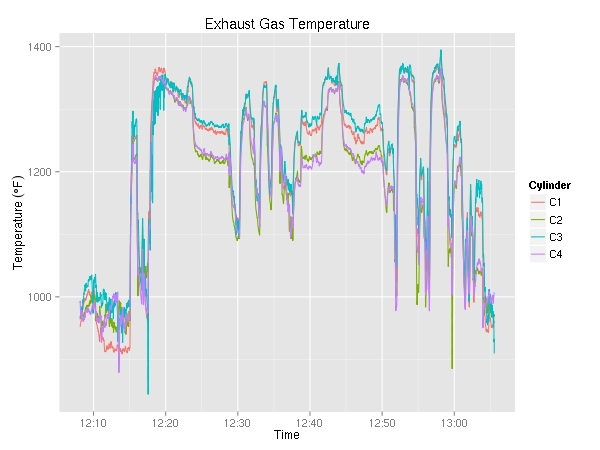 The cylinder head temperature and exhaust gas temperature graphs are mostly boring. 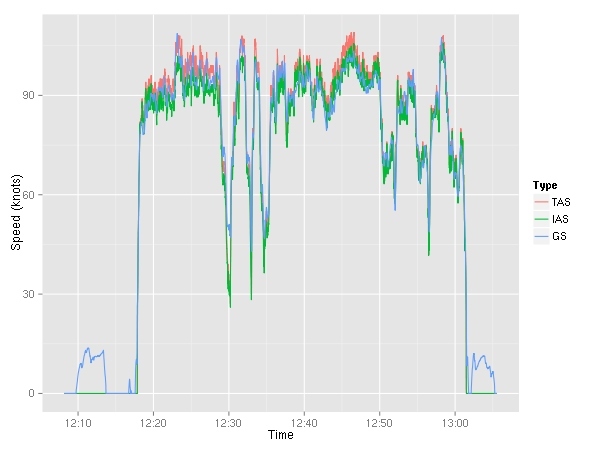 Unlike the previous graphs of CHT and EGT these clearly show a nice 30 minute long period of cruising. To be honest, I thought these graphs would be more interesting. I’ll probably keep plotting them in the future but not share them unless they show something interesting. 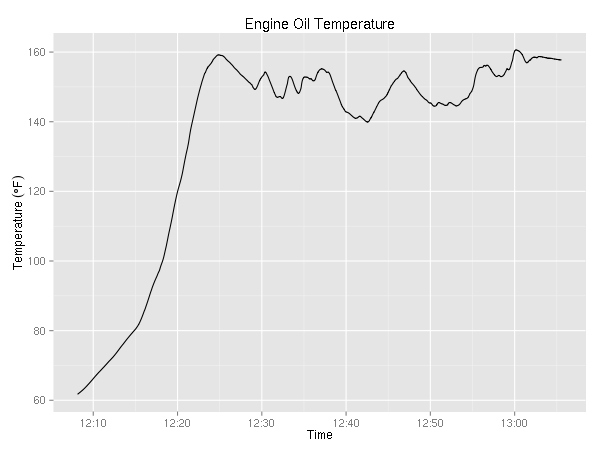 Same goes for the oil pressure and temperature graphs. They are kind of dull. Anyway, that’s it for today. Hopefully, next time I’ll try to look at how close the plan was to reality. 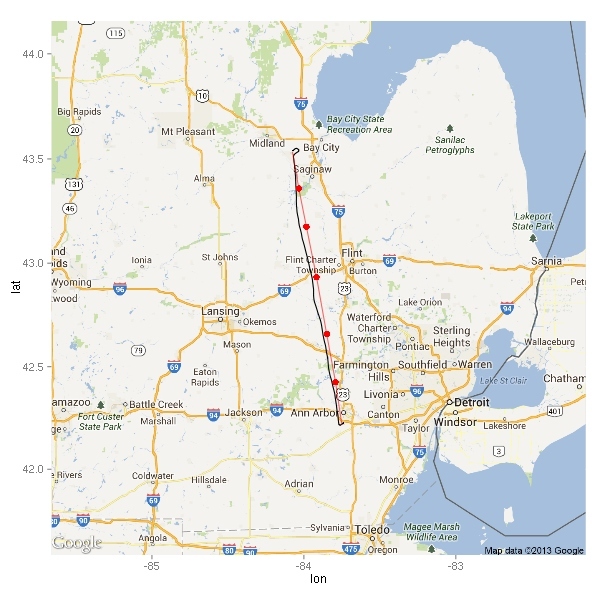 About a month ago I talked about using R for plotting GPS coordinates. Recently I found out that the Cessna 172 I fly in has had its G1000 avionics updated. Garmin has added the ability to store various flight data to a CSV file on an SD card every second. 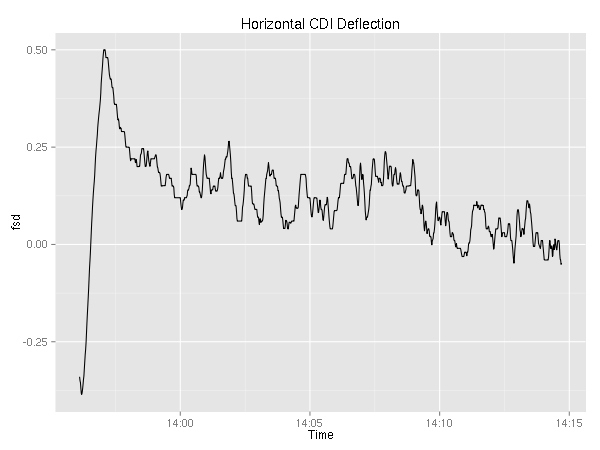 Aside from the obvious things such as date, time and GPS latitude/longitude/altitude it stores a ton of other variables. Here is a subset: indicated airspeed, vertical speed, outside air temperature, pitch attitude angle, roll attitude angle, lateral and vertical G forces, the NAV and COM frequencies tuned, wind direction and speed, fuel quantity (for each tank), fuel flow, volts and amps for the two buses, engine RPM, cylinder head temperature, and exhaust gas temperature. Neat, eh? I went for a short flight that was pretty boring as far as a number of these variables are concerned. Logs for cross-country flights will be much more interesting to examine. First of all, let’s take a look at the COM1 and COM2 radio settings. It makes sense, between listening to the ATIS and tuning in the ground, I spend 70 seconds listening to 134.55. The tower frequency (120.3 at KARB) showed up for a second because I switched away from the ATIS only to realize that I didn’t tune in the ground yet. Graphing these values doesn’t make sense. To keep track of one’s altitude, one must set the altimeter to what a nearby weather station says. The setting is in Inches of Mercury. The ATIS said that 30.38 was the setting to use. The altimeter was set to 30.31 when I got it. You can see that it took me a couple of seconds to turn the knob far enough. Again, graphing this variable is pointless. It would be more interesting during a longer flight where the barometric pressure changed a bit. 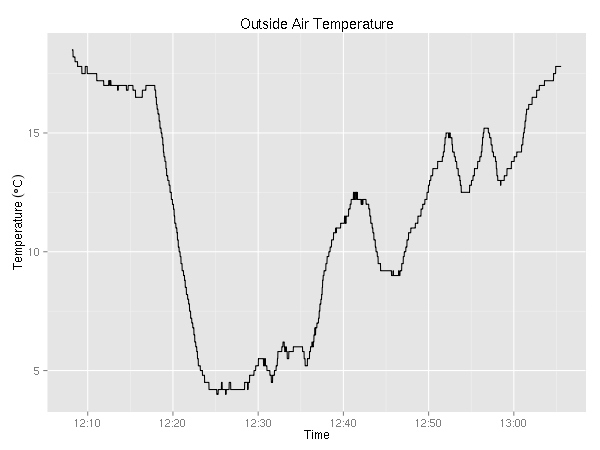 Ok, ok… time to make some graphs… First up, let’s take a look at the outside air temperature (in °C). In case you didn’t know, the air temperature drops about 2°C every 1000 feet. Given that, you might be already guessing, after I took off, I climbed a couple of thousand feet. 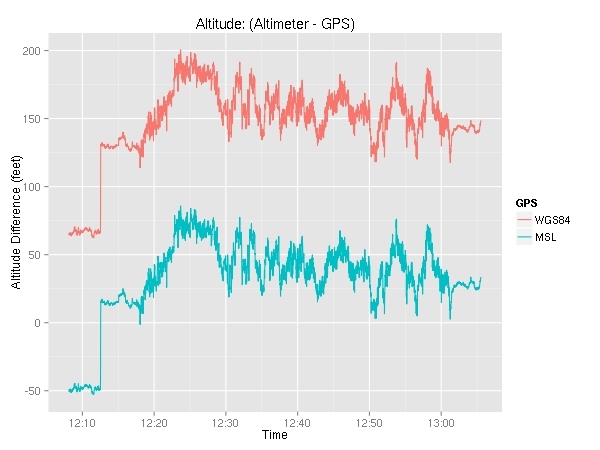 Here, I plotted both the altitude given by the GPS ( MSL as well as WGS84) and the altitude given by the altimeter. 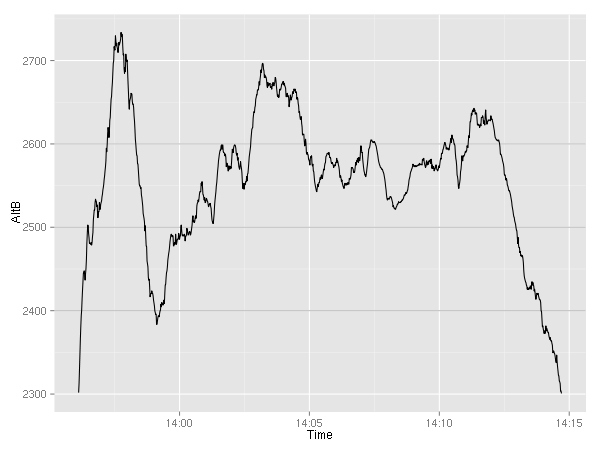 You can see that around 12:12, I set the altimeter which caused the indicated altitude to jump up a little bit. Let’s take a look at the difference between the them. Ok! It’s time to look at all the various speeds. The G1000 reports indicated airspeed (IAS), true airspeed (TAS), and ground speed (GS). 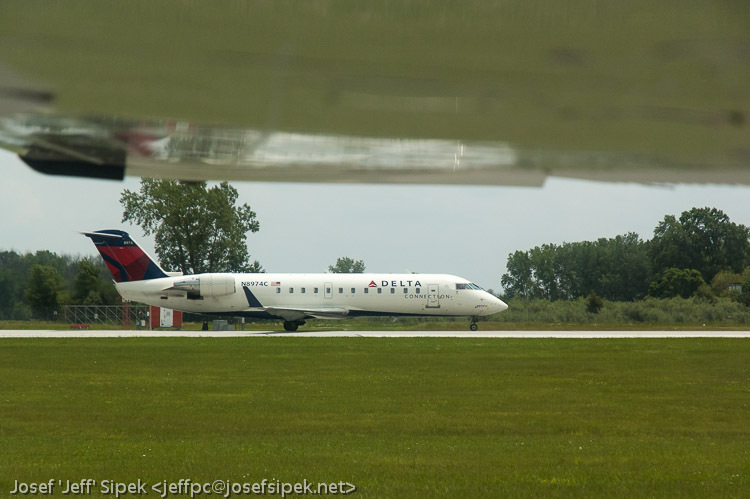 We can see the taxiing to and from the runway — ground speed around 10 kts. (Note to self, taxi slower.) 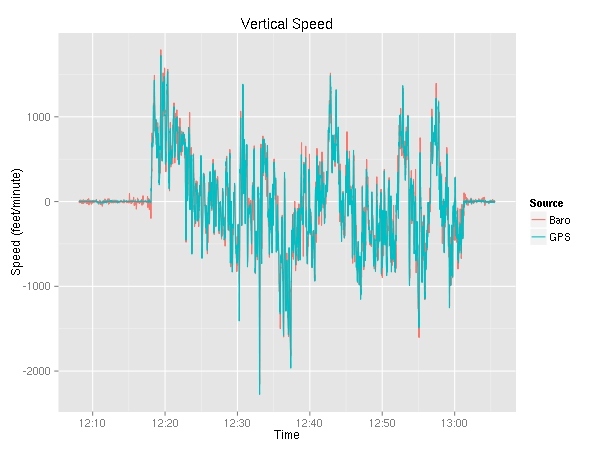 The ground speed is either more or less than the airspeed depending on the wind speed. 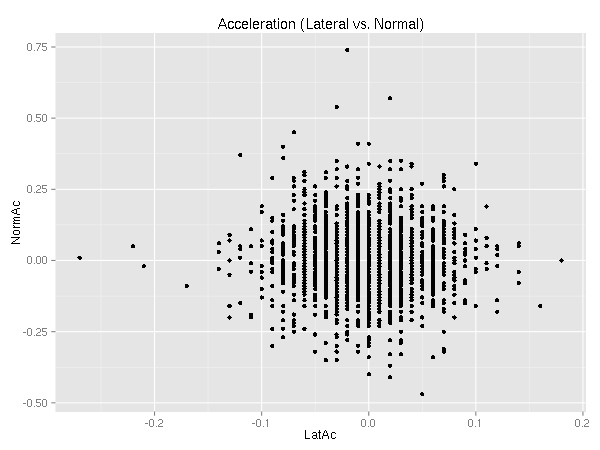 As far as lateral acceleration goes, there were only 41 points beyond 0.1 Gs 30 of which were below 2000 feet. (KARB’s pattern altitude is 1800 feet so 2000 should be enough to easily cover any deviation.) Both of these counts however include all the taxiing. A turn during a taxi will result in a lateral acceleration, so let’s ignore all the points when we’re going below 25 kts. Much better! Only 26 points total, 13 below 2000 feet. Where did these points happen? (Excuse the low-resolution of the map.) 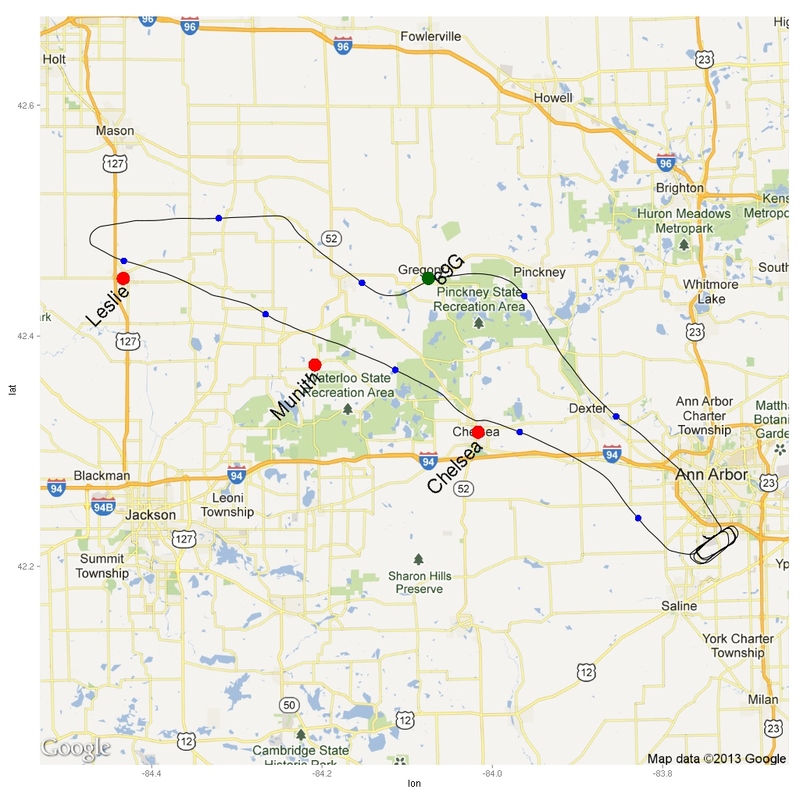 You can also see the path I flew — taking off from runway 6, making a left turn to fly west to the practice area. The moment I took off, I noticed that the thermals were not going to make this a nice smooth ride. I think that’s why there are at least three points right by the highway while I was still climbing out of KARB. The air did get smoother higher up, but it still wasn’t a nice calm flight like the ones I’ve gotten used to during the winter. Looking at the map, I wonder if some of these points were due to abrupt power changes. Here’s a close-up on the airport. This time, the point color indicates the amount of acceleration. There are only 4 points displayed. Interestingly, three of the four points are negative. Let’s take a look. The altitudes look a little out of whack, but otherwise it makes sense. 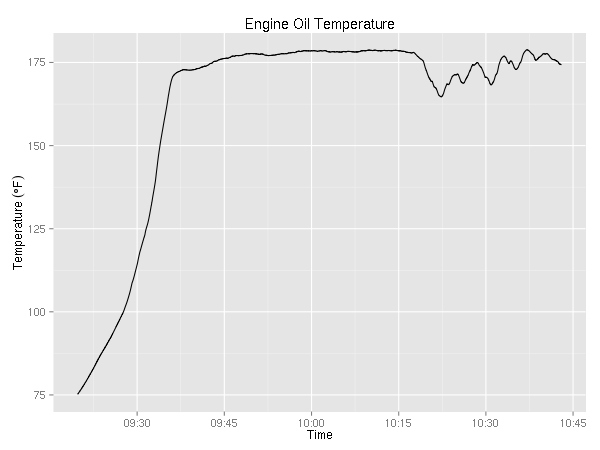 #2835 was probably the time throttle was pulled to idle. 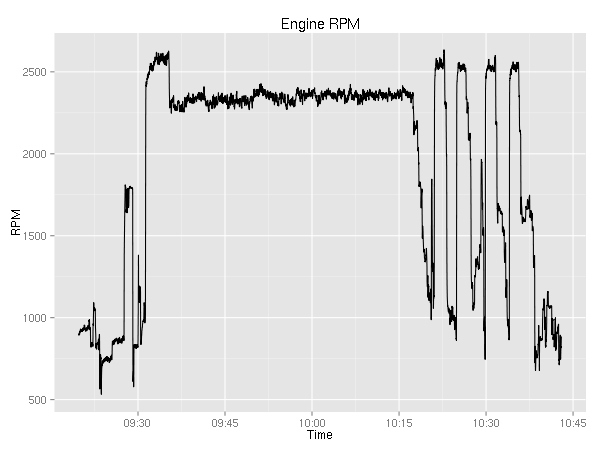 Between #2848 and #2849 throttle went full in. 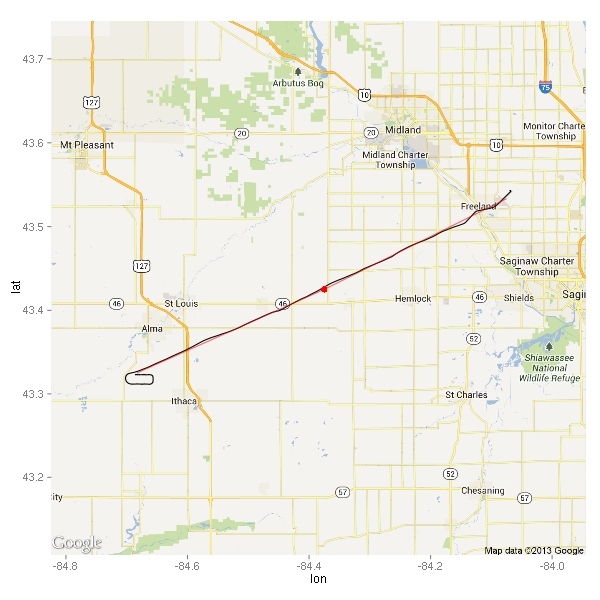 Ground was most likely around 832 feet and touchdown was likely at #2846 as I guessed earlier. 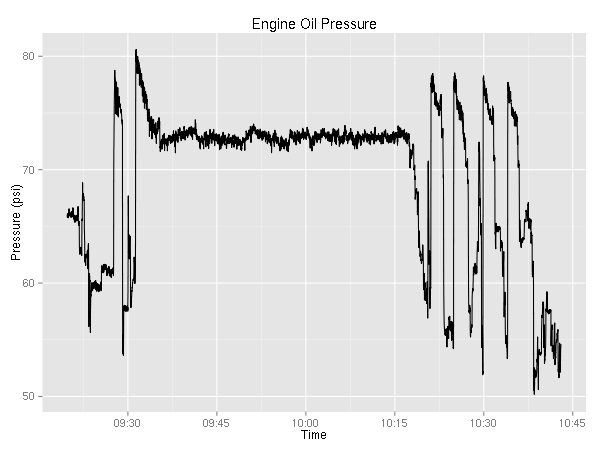 Let’s plot the engine related values. 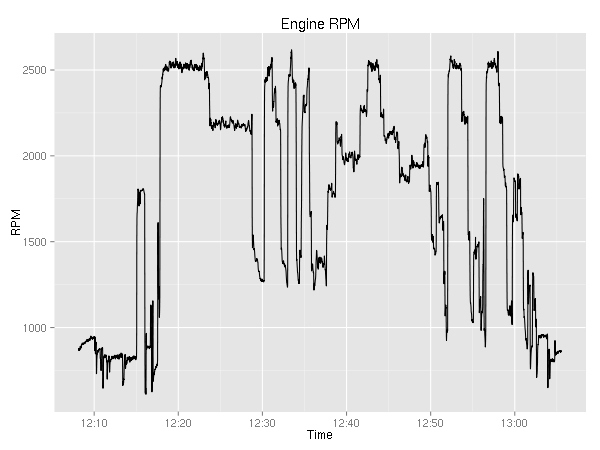 First up, engine RPMs. It is pretty boring. You can see the ~800 during taxi; the 1800 during the runup; the 2500 during takeoff; 2200 during cruise; and after 12:50 you can see the go-around, touch-n-go, and full stop. 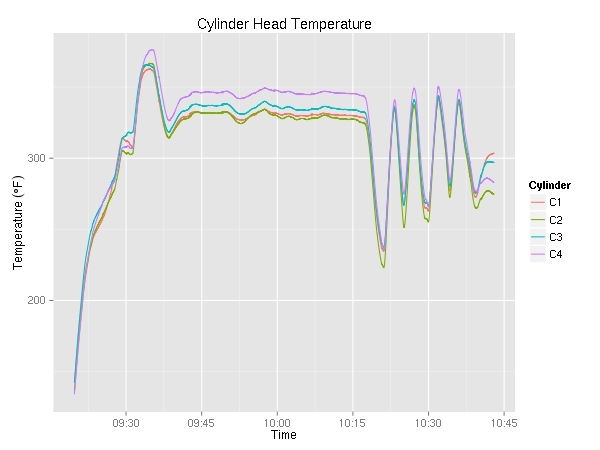 Next up, cylinder head temperature (in °F) and exhaust gas temperature (also in °F). 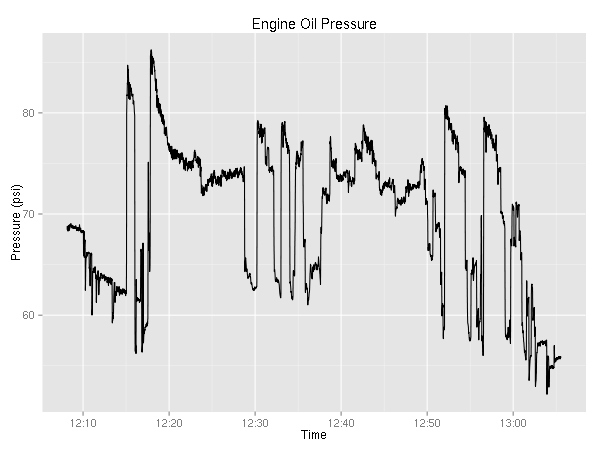 Since the plane has a 4 cylinder engine, there are four lines on each graph. As I was maneuvering most of the time, I did not get a chance to try to lean the engine. On a cross country, it be pretty interesting to see the temperature go up as a result of leaning. 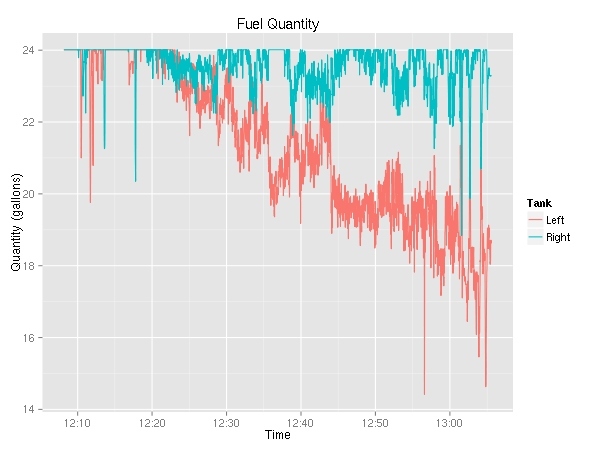 Moving on, let’s look at fuel consumption. This is really weird. For the longest time, I knew that the plane used more fuel from the left tank, but this is the first time I have solid evidence. (Yes, the fuel selector was on “Both”.) 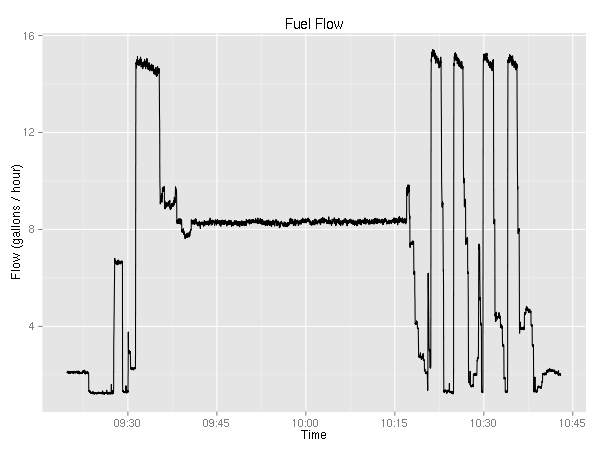 The fuel flow graph is rather boring — it very closely resembles the RPM graph. Ok, two more engine related plots. 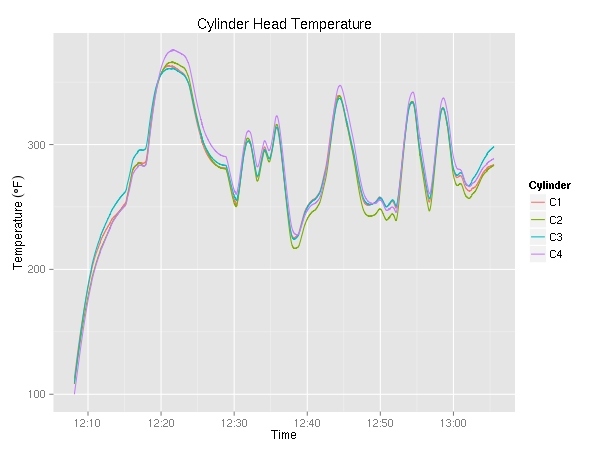 It is mildly interesting that the temperature never really goes down while the pressure seems to be correlated with the RPMs. 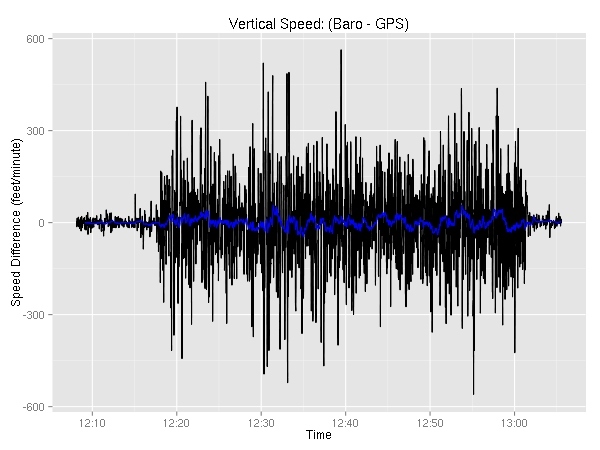 There are two variables with the vertical speed — one is GPS based while the other is barometer based. As you can see, the two appear to be very similar. Let’s take a look at the delta. In addition to just a plain old subtraction, you can see the 60-second moving average. Not very interesting. Even though the two sometimes are off by as much as 560 feet/minute, the differences are very short-lived. Furthermore, the differences are pretty well distributed with half of them being within 50 feet. 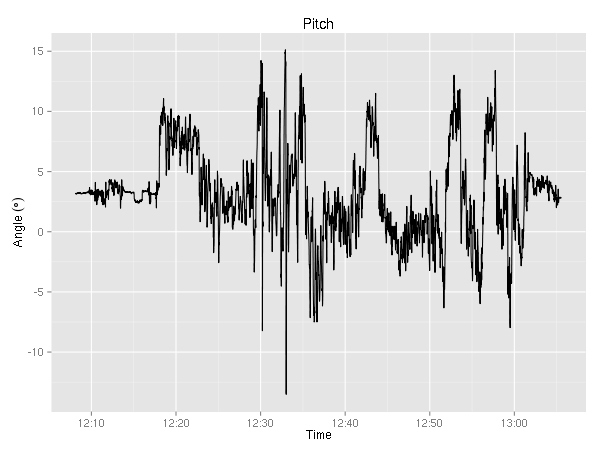 Ok, last but not least the CSV contains the pitch and roll angles. I’ll have to think about what sort of creative analysis I can do. The only thing that jumps to mind is the mediocre S-turn around 12:40 where the roll changed from about 20 degrees to -25 degrees. I completely ignored the volts and amps variables (for each of the two busses), all the navigation related variables (waypoint identifier, bearing, and distance, HSI source, course, CDI/ GS deflection), wind (direction and speed), as well as ground track, magnetic heading and variation, GPS fix (it was always 3D), GPS horizontal/vertical alert limit, and WAAS GPS horizontal/vertical protection level (I don’t think the avionics can handle WAAS — the columns were always empty). Additionally, since I wasn’t using the autopilot, a number of the fields are blank (Autopilot On/Off, mode, commands). A while ago I learned about CloudAhoy. Their iPhone/iPad app uses the GPS to record your flight. Then, they do some number crunching to figure out what kind of maneuvers you were doing. (I contacted them a while ago to see if one could upload a GPS trace instead of using their app, sadly it was not possible. I do not know if that has changed since.) I think it’d be kind of cool to write a (R?) script that’d take the G1000 recording and do similar analysis. The big difference is the ability to use the great number of other variables to evaluate the pilot’s control of the airplane — ranging from coordinated flight and dangerous maneuvers (banking too aggressively while slow), to “did you forget to lean?”. Update (2016-10-10): Out of the blue, I got an email from the CloudAhoy guys letting me know that a lot has changed since I wrote this post three and a half years ago and that they support uploading of lots of different flight data file formats. They seem to have some very interesting ways of visualizing the data. I think I’ll have to play with it in the near future.